I’m turning into the bus stop of blogs. You wait ages for a new post, and then two come along at once. Following on from the post about the filter bubble of social media that I put up the other day, I thought it might be useful to look at some of the finger pointing. The remain/leave totals don’t add up to 100% – that’s because the table ignores the undecideds for each age group, as this was based on voting intention rather than actual votes. 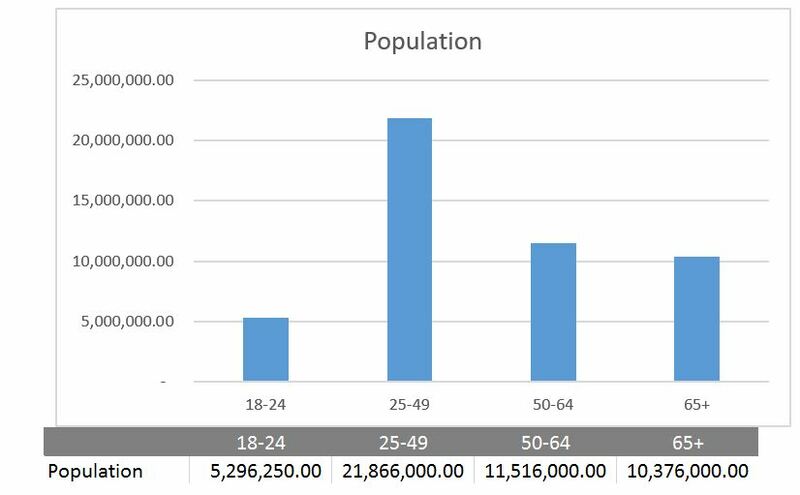 From this we see that the 18-24 age group are by far the smallest in this. Hardly surprising – this group spans 5 years, whereas the largest age group (still broadly pro-remain) is the 25-49 age group, which is 4x the size. The older age groups (both pro-brexit) add up to about the same number as the 24-49 age group. Based on this data, remain still lose, but the overall margin of victory is quite a bit smaller than we saw on the night – about 780K. The number of people that were still undecided is about 9x this number – easily enough to have swayed the vote one way or the other. The turnout on the night was about 72%. Very high for a UK election of any kind, but still, more than a quarter of those eligible to vote didn’t bother. For whatever reason. 36% of people aged from 18-24 voted. In this table, leave still wins, and by about the same margin as we saw on the night – although the numbers are a bit smaller. The margin of victory was 1.8 Million- or about half of the number of people in the 18-24 age group who didn’t bother to vote. If this age group had shown the same commitment to voting as the 50-64 age group (77% turnout), there would have been roughly 1 million more votes for remain than there were on the night. In the last post I wrote, I finished by saying that the filter bias we have in Facebook tends to fool us into thinking that a specific opinion is more widely held than it is, and that campaigning actively in the community would be a more effective way of changing opinions than simply posting memes on Facebook. Here I’m going a bit further. As I said above, there’s a rather poisonous meme doing the rounds that older people are screwing the youth because they’ve voted out. More accurately, the youth have screwed themselves by not voting at all.